Editorial – Sega’s staying ahead of the competition with advanced video game technology, including an assortment of new peripherals and accessories for their game systems. Mega Mail – Any questions? This is your chance to ask the experts! Read on to get the latest breaking news in the Sega World! Hi-Tech Sega – A look at Sega’s new 6 button controller and the latest on the 3-D war between Sega’s Slipheed and Nintendo’s StarFox. Coming Attractions – Slipheed, debuting from Sega, is a revolutionary new breed of shooter, taking polygon graphics and texture mapping to the limits! Sega CD File – Buckle up for two intense graphic trips on your Sega CD with Road Avenger and Time Gal. Both will keep you in awe for hours! Snatcher can best be described an a cyberpunk themed graphical adventure game. In addition to its cyberpunk theme, what made it unique for the time was its mature themes and in-depth story. Snatcher was written and designed by Hideo Kojima (who would later go on to create the Metal Gear Solid) for Konami and first released in 1988 for the PC-8801 and MSX2 in Japan. Snatcher was enhanced and released for the TurboGrafx-CD and later in 1994 again for the Sega CD. 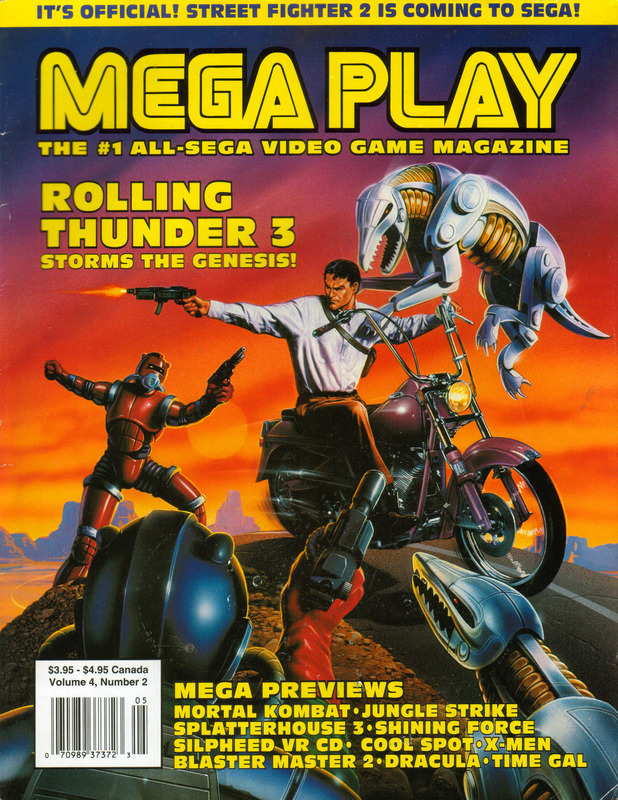 The Sega CD version would be the only English language version of the game and the only version released in North America. Versions would also later be released for the Sega Saturn and PlayStation but these were Japanese only releases. The story is set in a not too distant future in which android-like beings called Snatchers are snatching victims and taking their place in disguise. You play the role of an officer in a special police force created to fight these Snatchers, the origin of which is unknown. The story and visual style was influenced by movies such as Blade Runner, Terminator and Akira. The Sega CD is arguably the best version however it has been censored slightly from the Japanese TurboGrafx-CD version (though not as much as later versions). Given that is has a heavy reliance on text and the Sega CD version is the only English language version, this is really the only reasonable option for a North American audience anyway. Unfortunately, it is also a very expensive option if you want an original copy. However, emulation is an option as well. For whatever reason, there has never been a more modern re-release of this game in North America so the Sega CD version is your only option. However, for cyberpunk and/or graphic adventure fans, this game is well worth trying. Give it a shot via emulation if you aren’t willing to fork over the absurd eBay cost of an original. Alien Trilogy – Finally, the long-awaited Cheat Menu has now been found…great cheats available! Night Warriors – Double your turbo speed and get a non-shaded pause screen with this code! Game Shark Codes – The Shark can be your friend if you enter the passwords correctly for the SS and PS. SFA 2 – Uncover Chun-Li’s old uniforms and two hidden fighting stages by entering this code. Play with the Power of a God in this Latest Fighter – The latest entry into the fighting genre is another great title by the gurus at Williams but not by the same MK team. This new 3-D fighter was designed by a completely different group, however, they do the Williams name proud. It is an exceptional example of true 3-D perspective fighting, with all the moves, combos and fatalaties to keep fighting fans happy. Check out the first of many articles on War Gods, covering the initial stages and moves that will get you up and playing. Fight or Die for your Party in Guardian Heroes – Guardian Heroes, Treasure’s first action/adventure title for the Saturn, pits you against a number of worthy (and just plain tough) foes. 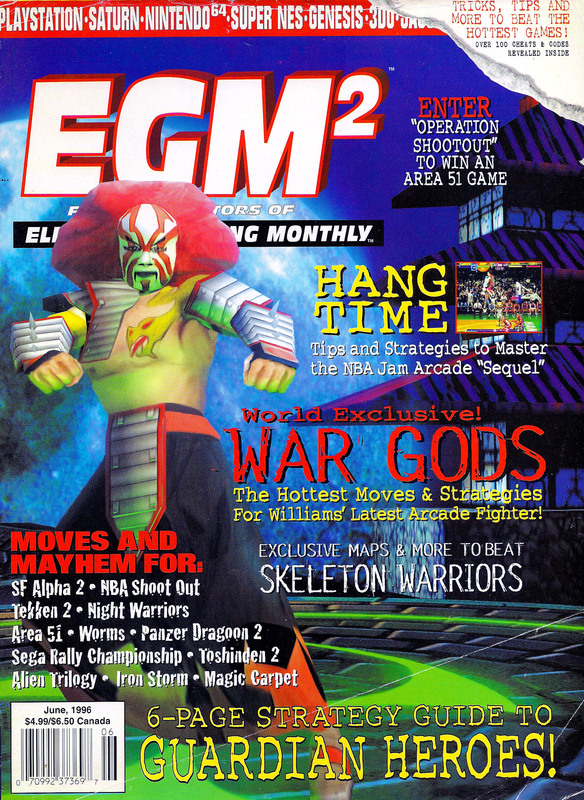 In this EGM^2, there is a six-page jam-packed guide to help players with moves, opponents, levels and more. It also details characters’ backgrounds and strategy. As well, there are several detailed maps pointing out important information gamers should know. There is also a quick reference guide that gives players some very useful tips. Skeleton Warriors Has More Than Meets the Eye – Deceptively complicated with gameplay and skill level gradually increasing, Skeleton Warriors might be too much for a non-observant player. With huge numbers of enemies on screen at one time, many can become overwhelmed during any point in this action game. However, in this issue there is a detailed guide that takes the reader by the hand and helps him/her through the more difficult levels of gameplay. With much-needed hints on Bosses and levels, this guide won’t leave anyone stranded. They Don’t have a Backbone, But They Sure Are Tough – Who said playing with worms couldn’t be fun? They are if you send in a unit to destroy an opponent with mines, missiles and sheep (yes, sheep!). In this mud-free strategy guide, players will be victorious because everything to know about this game has been packed into this issue. Find out which strategy works best and what weapons to use during certain situations. For example, the Prod works well if an enemy is close to a cliff. However, if you want to knock the opponent forward, the Dragonball works best!